Clean up unredeemed keys at the distribution level in your Mimeo Digital administrative account. If you created more keys for a distribution than you actually needed, that means the extra keys will be unredeemed, which can be a security risk. 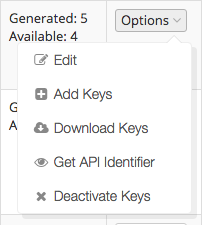 While you can always deactivate keys on an individual level, it's faster to deactivate all unredeemed keys from the distribution at once.